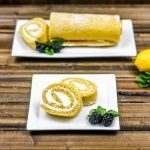 This bright, refreshing lemon cake roll combines moist lemon cake with lemon cream filling to make the perfect dessert for a spring gathering! You knew it was going to happen. You knew I couldn’t let a week of sweet posts go by without sharing something lemon. I just wouldn’t be ME if I did that! Spring is definitely the season where we start to see all the lemon things coming out, and that makes me one happy girl. I seriously don’t know if there is anything lemon that I don’t love. And, I seem to be making a mini lemon lover out of Nat, as well. #winning. 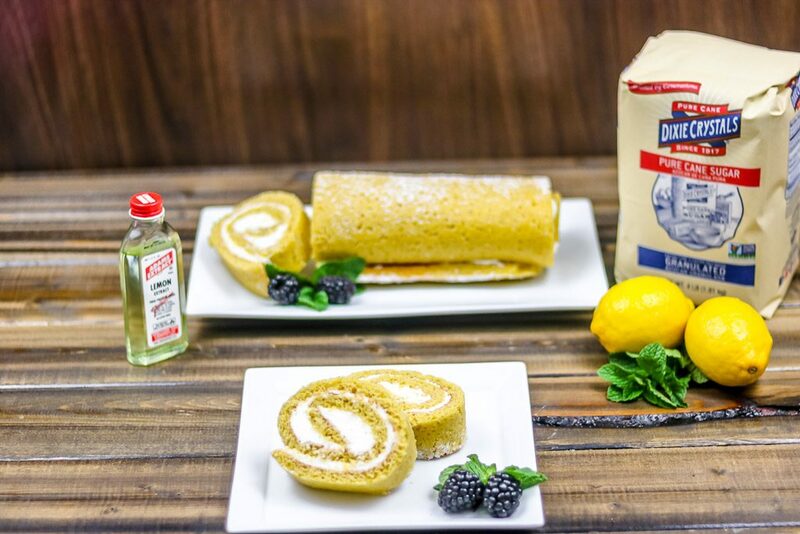 So, let’s talk about this lemon cake roll. 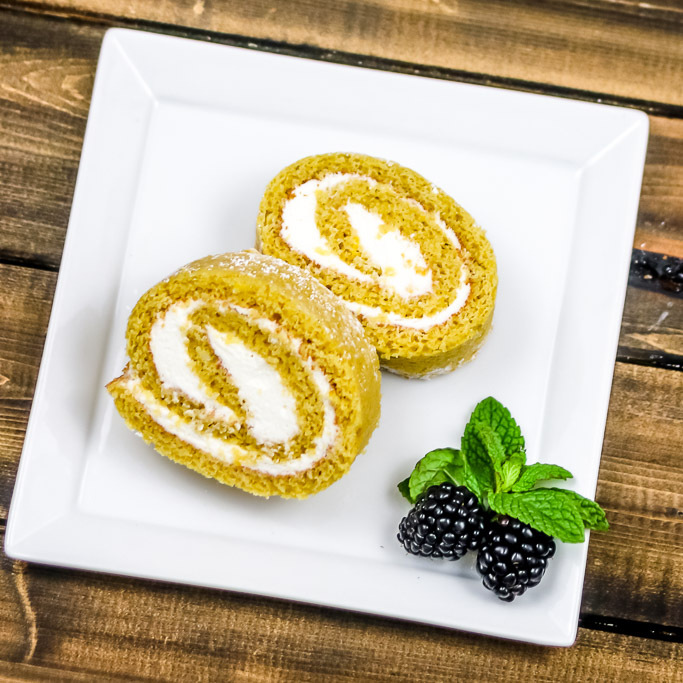 I’d never made a cake roll before – of any variety – but when I saw that this was a thing, it was a done deal. Any time I make a new type of dessert that I’ve never attempted before, I get a little nervous. Because, the perfectionist-wannabe in me, doesn’t want to screw it up. Making and baking the cake was easy peasy. But when I got to the part of the recipe where it tells you flip the cake out of the pan onto a powdered sugar-cover kitchen towel, my interal alarms of fear and impending failure started screaming. I stood there holding the pan for what felt like forever, turning my hands – which were covered with oven mitts because it was fresh out of the oven – different ways to try and figure out in my head just how this was going to work. How was I going to flip it and have it land in one piece on the towel. I finally just told myself I had to do it and deal with the aftermath when it came. And you know what? The only aftermath I had to clean up was the spray of powdered sugar that blew everywhere when the cake hit the towel. Which I was juuuuust fine with. The cake didn’t break. Hallelujah! Then it was time to roll it up in the towel and let it cool, while making the filling, and then unroll it to add the filling. This also sounded odd to me, but I did as instructed, and it all turned out perfectly. I tell you all of this so that if you feel a bit uneasy or intimidated about trying a new type of recipe, you can rest assured that it will probably turn out just fine. And even if it doesn’t, it’s better to try! I am so glad that I did, and the result was an amazing lemon cake roll that I was able to share with my co-workers, and it got rave reviews. This recipe features two of our sponsors this week – Dixie Crystals and Adams Extract. 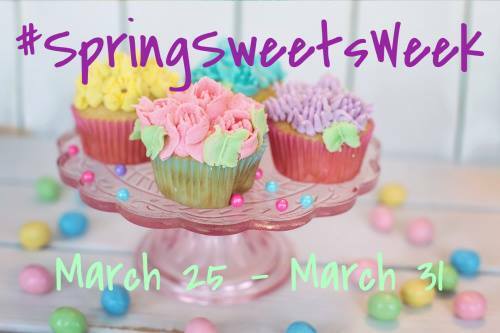 Of course you can’t make a cake without sugar! Dixie Crystals provided the granulated sugar that went in the cake, and I also used their powdered (confectioner’s) sugar in the filling and sprinkled on top! Adams Extract sent us some of their fabulous extracts, including the lemon extract, which I used in the filling as well, to give it just the perfect touch of lemon flavor to go along with the cake. If you haven’t checked out the prize packages – including one from each of these sponsors, check it out here, and enter below! Now, I bet you’re ready for that lemon cake roll recipe, aren’t you?!? Check out all the other recipes below from today, too! In a mixing bowl or stand mixer, beat the eggs at high speed for 2 minutes, until frothy and dark yellow. Mix in sugar, lemon juice, and zest. In a separate bowl, whisk together salt, baking powder, and flour. Add into wet ingredients and mix at low speed until just blended. Spread the batter into the prepared pan.Since the batter is a very thin layer, you will need to use a wooden spoon or spatula to spread it to all the corners of the pan. Bake for 9-11 minutes. While the cake is baking, set a large, clean kitchen towel out on a large work surface. Sprinkle liberally with powdered sugar (about 1/4 cup). As soon as the cake comes out of the oven, turn it over on the kitchen towel sprinkled with powdered sugar. Remove foil carefully. Working from the short end, fold the edge of the towel over the cake. Roll tightly, rolling up the cake into the towel. Let cool completely while rolled, at least one hour. While the cake is cooling make the filling. Beat the heavy whipping cream and powdered sugar until stiff peaks form. Stir in the lemon extract. Refrigerate until ready to use. When cake is cool, carefully unroll the towel. Spread the lemon cream over the cake, as evenly as you can. Roll the cake again, gently but tightly (and withouth the towel this time.) Wrap in plastic wrap to prevent drying out, and refrigerate for at least one hour, up to overnight. When ready to serve, sprinkle powdered sugar on top, slice the cake and serve with berries on the side, if you like! I almost made a cake roll. They always look so delicious. And this lemon one is right up my alley!! This looks so pretty and fancy, it’s a wow dessert for sure. It so pretty. I think a cake roll makes such a nice presentation. Such a pretty dessert! I am loving lemon desserts right now so this looks so good to me. Congratulations on the unbroken cake! A roll cake is on my bucket list but I haven’t yet conquered my fears. Yours looks delish. Lemon is so perfect for spring! I love the sound of this cake roll! 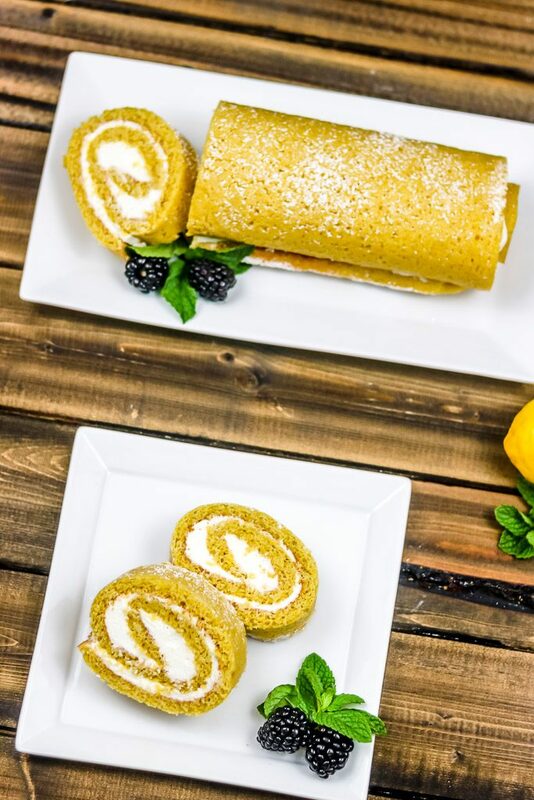 I love cake rolls and a lemon one sounds delicious! 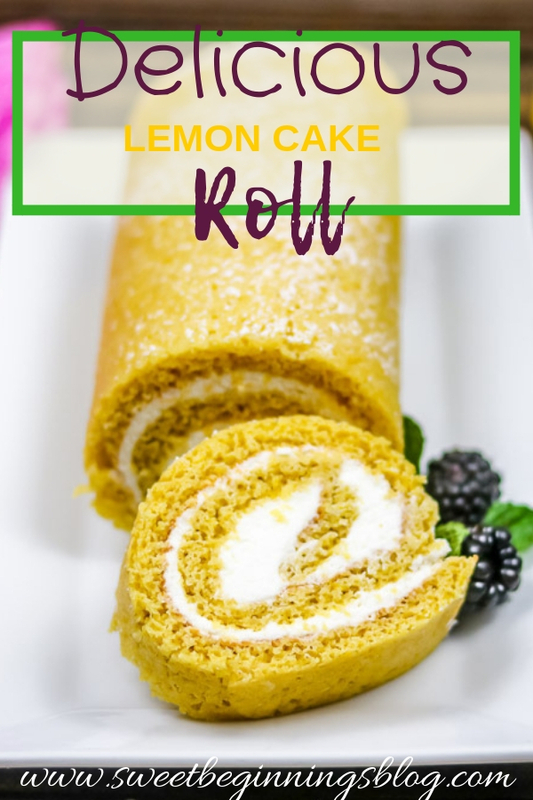 I have been wanting to make a cake roll for a while now and this lemon version looks fabulous! 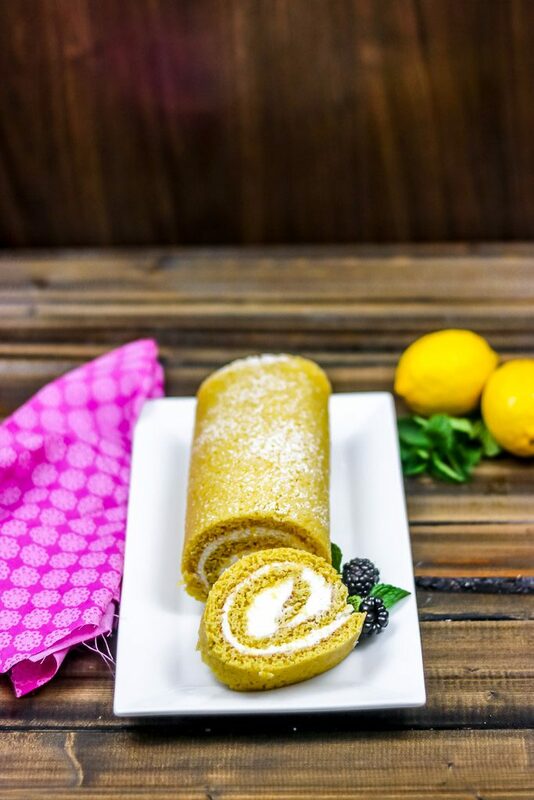 This cake roll looks so luscious and lemon is always a perfect flavour for springtime! I too am intimidated at the thought of making a cake roll, even though I’ve wanted to try it for years. 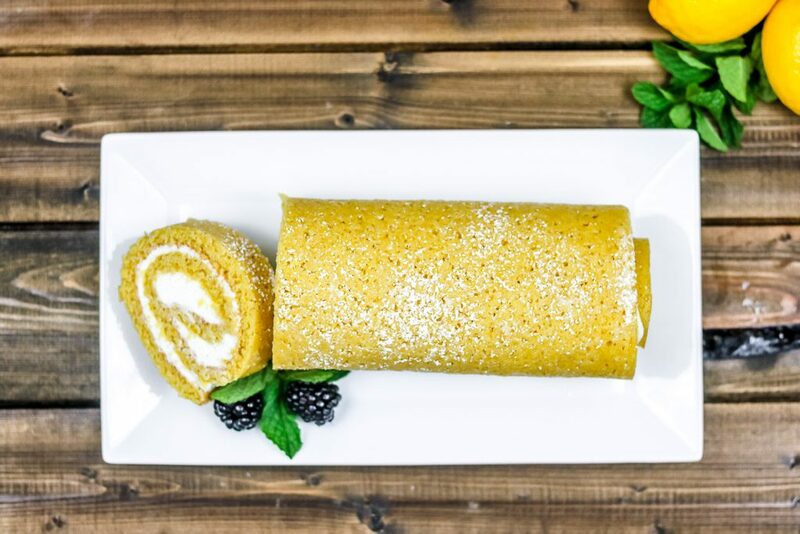 I’m a huge fan of citrus desserts, so after reading how well your cake roll turned out, I think I’m finally going to try and make one! Lemon cake roll??? No one has ever made me a lemon cake roll. I am the queen of lemon desserts (not to make them, to EAT them!) I guess I’ll need to do this one myself! This is such a beautiful cake roll! I love the creativity of using lemon! I know that this would be a big hit in my house! Can the base be backed today and filled tomorrow and served Sunday? I think it will keep just fine for that schedule! I took it to work and we ate it over a week’s time period and it was still good. Just keep it wrapped in the towel and maybe in a tupperware or other container with a lid, so it doesn’t dry out before you fill it. Your cake roll is so pretty and yummy looking, if it was sitting in front of me, I couldn’t resist it! I would have to take a bite or three! !